Have fun with the tarzan swing and the canopy walkway, one of the world’s longest hanging bridge !! 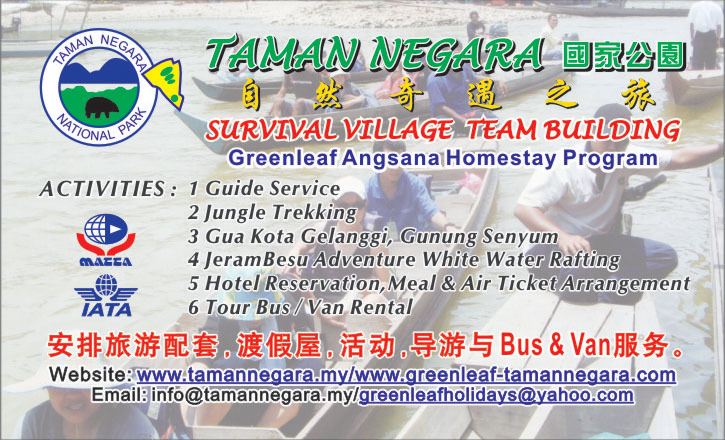 Experience a boat ride upstream to Kuala Trenggan (Trenggan River) in a wooden boat and shooting the rapids. Althought some of the rapids are very shallow, the skillful and experience boatmen still manage to pass through easily. Check it out yourself and be prepared to get wet! 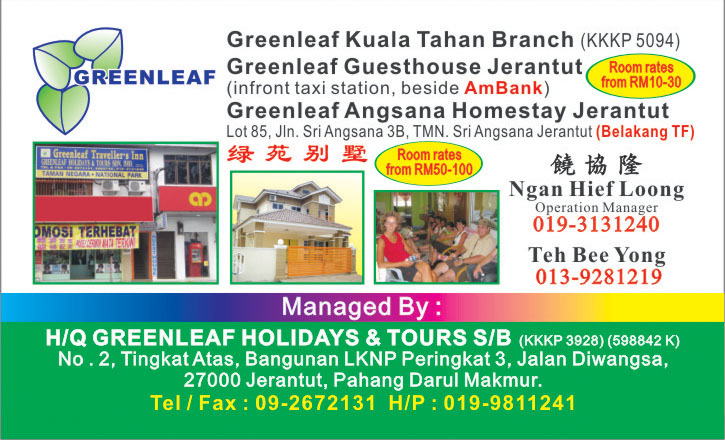 - Peak Period Rates (1st July to 15th September ) will surcharge RM20 per person. *Child rate is refer to children between age 3 to 10 years old. *For child age 1 to 2 years old RM50 - no bed provided. Excursion to Cave Kota Gelanggi. Bring along torch light.Explore this 150 million year old historical and mythical caves complex and witness its unique flora, fauna and its magnificent rock formations which will definitely captivate you. 出 发 前 往 山 洞, 探 勘 这 由 千 年 化 石 所 形 成 的 非 一 般 山 洞. 请 携 带 手 电 筒, 洞 内 阴 暗 潮 湿! 04:00pm Head for Kuala Tahan (pristine wild jungles that's 130 million year-old). 09:00am Jungle trek to Teresek Hill (344m). From the hilltop and in clear sky you may be able to see the peak of Gunung Tahan.The trail is passing on one of the best bird watching habitats area and can hear melodious song of hornbills and etc . √ Things to bring: T-shirt, shorts, torch light, sport shoes, slipper or sandal, toiletries, drinking water, swimming suit, rucksack, poncho, insect repellent, shocks.